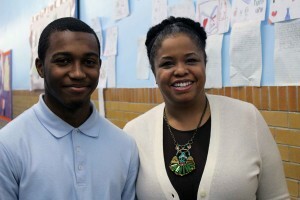 On day one of yet another three-day suspension, eighth-grader Naseer Wilkerson asked Principal Fuentes if he could come back because he “didn’t want to miss another day of school.” Turnaround’s Student Support System expedited a behavioral and academic assessment, followed by counseling from the community mental health provider. With this help, Naseer began to trust that the adults in his school truly cared about him and his future. The results – no more fights or suspensions and his natural charisma and leadership put to use as peer mediator, junior coach and boy scout. Naseer even won his school’s resiliency award.